The first official visit to Ireland by the British Deputy Prime Minister has been cancelled following the death of Taoiseach Enda Kenny's mother. The British-Irish Council Summit has also been postponed as a mark of respect to Eithne Kenny. The 93-year-old, who died in hospital yesterday surrounded by her family, will be buried tomorrow morning in Castlebar, Co Mayo. Her remains will be removed to the Holy Rosary Church this evening. Mrs Kenny, who is survived by the Taoiseach and his siblings John, Henry, Kieran and Marie Hastings, was actively involved in the political life of the county for more than 60 years. Political party leaders, members of the Irish Government, Northern Ireland Secretary of State Owen Paterson and Julian King, British Ambassador to Ireland, will be among those attending her funeral. 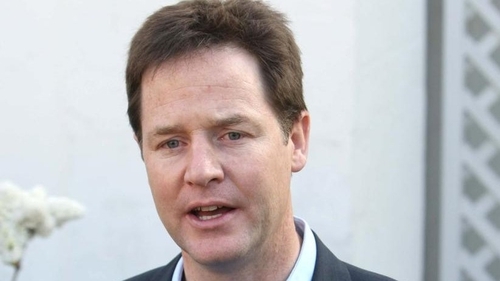 The British Embassy confirmed that Deputy Prime Minister Nick Clegg has cancelled his entire visit, which was to include a courtesy call to Government Buildings and to Ireland's new President Michael D Higgins, and talks with his counterpart, Tánaiste Eamon Gilmore. The main purpose of his visit was to attend the British-Irish Council, which was established under the Good Friday Agreement to promote relationships between the administrations across Ireland and the UK. He was also expected at the Conway Institute at University College Dublin and to attend a reception for business leaders. President Michael D Higgins has led mourners at the removal of the remains of Mrs Eithne Kenny in Castlebar. More than 8,000 people filed past her coffin and offered their sympathy to members of the Kenny family between 4pm-10pm. Mrs Kenny's remains were received at the parish church in Castlebar by Fr Pat Donnellan, the Parish Priest of Islandeady. Requiem mass will be celebrated in Castlebar tomorrow morning and burial will take place afterwards in Islandeady Cemetery. Several Cabinet ministers and politicians from all parties travelled to Castlebar this evening to attend the removal service.